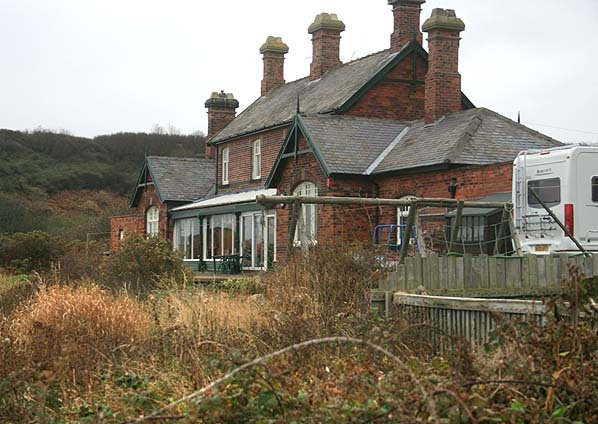 Sandsend Station is now a private residence, both the station building and the platform survive in good condition. The overgrown north end of the platform alongside the Cleveland Way footpath which can be approached by steps from the car park at the bottom of Lythe Bank. Evidence of the foundation of Sandsend viaduct can be seen in the adjacent beck. The pillbox for defending the Sandsend viaduct also survives as do the coal drops in front of the station, they have been converted into garages. Notes: Sandsend had a single platform on the down side of the line. 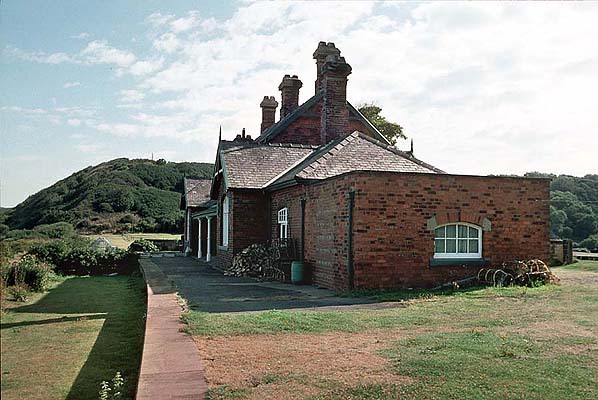 There was a substantial brick station building which incorporated the stationmaster’s house. There was one siding on the down side of the line running to coal drops behind the station. It branched from the line at the northern end of the station site. A wooden signal box was provided on the station platform but this was closed about 1905. Passing loops were added to other stations on the line in the early 1900s. This was an exception due to the extensive works which would have been needed. Apart from coal there were no other freight facilities at the station but a goods yard was sited at East Row a little way along the line in the Whitby direction where there was a goods warehouse and a 2-ton crane. In later years three camping coaches were sited in the coal yard. The Sandsend viaduct was sited immediately south of the station. During WW2 a pillbox was built in the station yard to defend the viaduct. In the summer of 1933 the northern terminus was changed to Middlesbrough and trains were then routed by way of Nunthorpe, Guisborough and Boosbeck to meet the original route at Brotton. 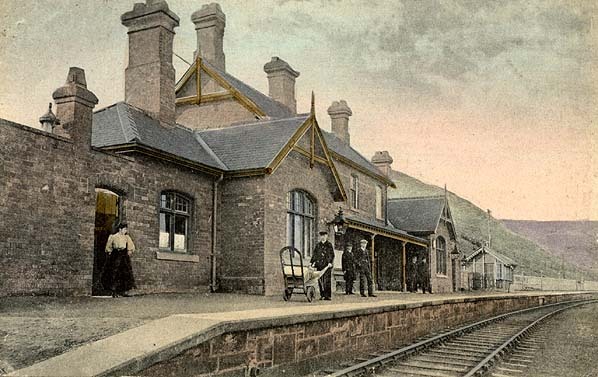 A reversal was required on this route at Guisborough where rules were relaxed and trains of up to seven coaches in length were propelled in and out of the station which was at the end of a spur. Occasional summer trains would make Brotton via Redcar and the Saltburn extension. Boosbeck to Brotton was closed completely on 12th September 1964.
between them a short stretch of the original course along the cliff edge remains. Five steel tubular viaducts were erected on the line at Upgang (330 ft long, 70 ft high with 6 spans), Newholm Bank (330, 50, 11), East Row (528, 30, 8), Sandsend (268, 63, 8) and Staithes (790, 152, 17). 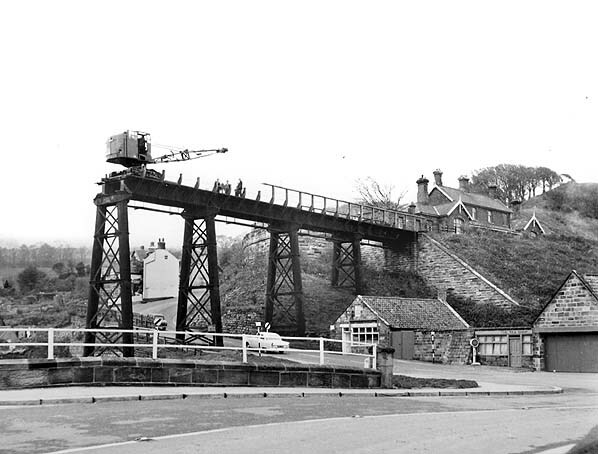 Staithes viaduct was protected by a wind gauge which rang a bell in the signal box when the wind pressure reached 28 lb/sq. ft. At this point traffic over the viaduct was suspended and could only be resumed after the structure had been inspected. Cleveland Railway at Loftus so allowing trains to run through from Whitby to Saltburn using the former Cleveland Railway route and the later NER connection between Brotton and Saltburn. On 16th July 1885 the Scarborough and Whitby railway opened and joined onto the WRMUR at Prospect Hill Junction so allowing direct trains to run between Scarborough and Saltburn. trains reversed at Prospect Hill Junction for Whitby Town station. 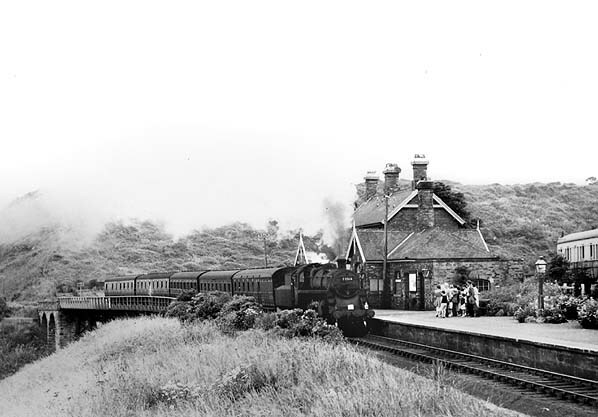 Train from Whitby arriving at Sandsend Station in the 1950's. Note the camping coach far right. After closure in 1958, the track was lifted in 1959 and the viaducts were demolished in 1960. Sandsend Station is seen at the end of Sandsend viaduct.